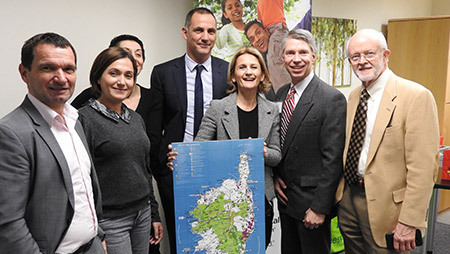 The Corsican leadership arrived in Paoli on Wednesday, April 4. The entourage was headed by President Gilles Simeoni and Foreign Minister Nanette Maupertuis. Upon their arrival, a reception was held at Daylesford Crossing in Paoli, compliments of the organization’s management. Attendees included local business leaders, legislators, PBPA members and residents of the facility. On Thursday morning, a panel discussion was held at Paoli Hospital. The panel consisted of representatives of the county, Southeastern Pennsylvania and the state. 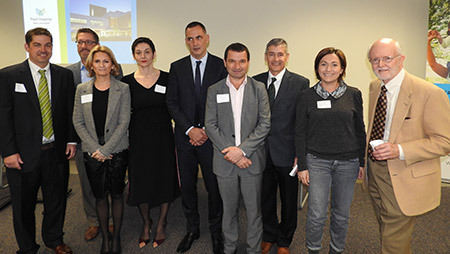 The objective was to discuss business and cultural opportunities between Corsica and, primarily, Southeastern Pennsylvania. Later that day, the Corsicans visited Lafayette College in Easton, Pennsylvania, where President Simeoni gave a talk to faculty, students and others. Following the talk, a reception was held in Chateau Chavaniac near the campus. On Friday, prior to their departure, the group visited the National Constitution Center in Philadelphia. 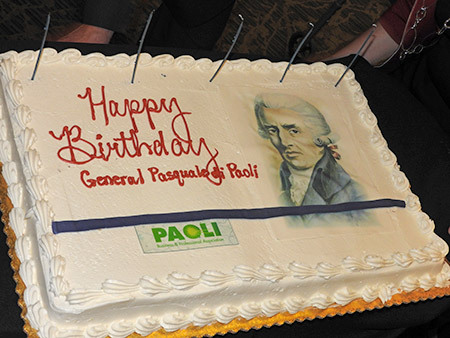 General Pasquale de Paoli, liberator of Corsica in 1755, wrote the first democratic constitution in Europe. Our constitution is based, in part, on his constitution. The PBPA planning committee consisted of George Steinmetz, Brad Zerr, Bonnie Haughey, Tom Dolan, Bethany McCardle and Ed Auble. Major contributors included the Paoli Village Shoppes, WSFS Bank, Metric Realty and PBPA. Daylesford Crossing and Lafayette College donated their receptions. Primo Hogie donated lunches. Matthews Paoli Ford donated van transportation. The contributions of all involved, whether time, treasure or talent, made the Corsican visit a great success. The strong relationship will continue as, collaboratively, we find ways to develop business and cultural ties.